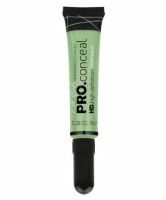 This concealer is amazing, and only $3. They have a huge range of shades and cover really well. I use them on my undereyes and on blemishes and they stay put all day. I love that I can run to my local CVS and grab them. The tube with attached brush makes application easy and precise. It's not bad, however the applicator is not very friendly. The product is very consistent and really blendable. This concealer is great for the five dollars that I bought it for. A guy at the accessories store strongly recommended it since he uses it everyday. When I saw it in store, they literally have EVERY tone and color you can think of, including corrective colors. The colors range from lightest to dark, and the corrective colors from green, blue, red, orange, etc. It's perfect to bring on the go when ...read moreyou are on a rush to go somewhere and you forget to put on your face makeup. It covers better that the previous one I used from from L'oreal. The pros are it's great coverage! It covers my dark circles and dark spots well. The texture is not too thick, and also not to thin. This product is perfect for an everyday normal and natural look. Oh! and you can buy multiple for contour! I saw on the display that you can buy a couple to achieve a contour look from their product. I'm using this when I get back to school in september soon. The cons of this product are: The only thing that annoys me is how it is in a pen form. Another con is that it has parabens. So be careful! when you get home, wash your face as soon as possible to be safe for your skin.